We would prefer to believe that the stuff in our lives is magically transported to store shelves. Or perhaps a more romantic vision would be delivery via a Santa-like character direct to our homes. But the reality is that every consumer good whether it be food, clothing or lumber makes all or some of its journey to us by truck. Yet this fact seems to be ignored or at best seen as a necessary evil. The vital role trucking provides still has done nothing to enamor them. They are seen as a blight, cursed on highways and city streets as noisy, dirty, the cause of congestion and an impediment to our travel. Drivers are seen as an integral part of these evil boxes on wheels so the image of the truck driver is no better. How to repair the image of the truck? Convert them into a dessert or ice cream delivery vehicle. We now have the Dessert Truck, the Treat Truck, Waffles and Dinges and Van Leeuwen Ice Cream running around town. I love the convenience of street food vendors. The problem is that there are few quality operations out there - I keep a sharp eye out for them but the good ones are scarce as hen's teeth and are no secret. Discovery is rapid and long lines become the rule. I wrote of NY Dosas in 2007. Lines at his food cart can be enormous. The same applies to Calexico in SoHo. And Speedy Gonzalez has disappeared. Now we have trucks bringing us confections. I recently wrote of the Dessert Truck run by a gourmet chef whose vision was to bring desserts to the streets which are of the quality found in the finest French restaurants. And he has succeeded - see the story here. 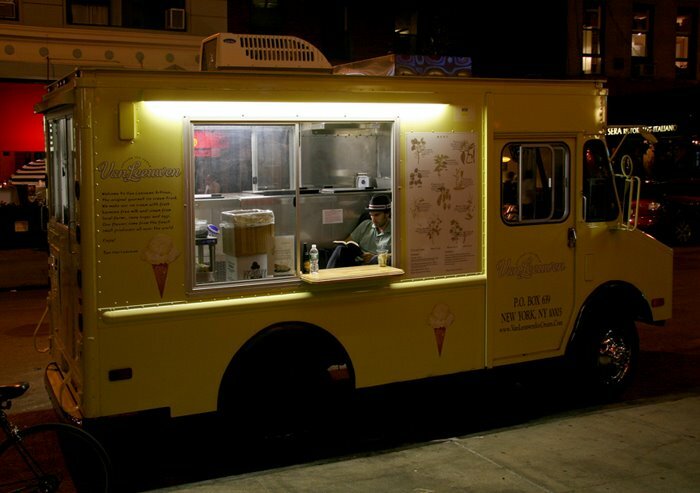 Brothers Pete and Ben Van Leeuwen now bring Van Leeuwen Artisan Ice Cream to the streets of the Village, SoHo and the Upper West Side in redesigned ice cream trucks. They meticulously craft their ice cream, sourcing ingredients from around the planet to produce their 10 flavors. Pistachio nuts from Mt. Etna, Michel Cluizel chocolate from France and vanilla beans from Tahitian vanilla orchids grown in Papua New Guinea. Everything about this business shows attention to details - business cards, colors, graphics and product. They also share an environmental commitment and use disposable goods from renewable sources.